So you’re anxious to start having fun with notarial records? And you were disappointed that you couldn’t find every last them, easily and quickly, digitized online to be studied at 3 a.m. in your bunny slippers? There are some fabulous collections of notarial records that are available online, even for those of us who — like The Legal Genealogist — really like our home computer comforts — and our bunny slippers. First, from mentor and genealogist-extraordinaire Elizabeth Shown Mills — who just happens to be an expert on Louisiana genealogy — comes word of a major collection of digitized records at the website called the Louisiana Digital Library. And many of the records that are digitized in this collection are notarial records: records created by the civil notaries we’ve been focusing on. Specifically, any record noted as being from the Cane River collection is a notarial record, and there may well be more. There are more than 1,900 items digitized in the collection, ranging from business records to emancipation petitions to apprenticeship papers and so much more. If you really want to get a taste of what Louisiana notarial records can offer, this is a great collection to look at. But I did mention that civil notaries aren’t limited to Louisiana, remember. There are civil notaries throughout those parts of the world where civil law (as opposed to British common law) is the dominant legal system. So if you want to play in notarial records, you can look elsewhere — and find massive collections that have been digitized and are available online. A huge collection, noted by reader Marc St-Jacques, is the notarial records of Quebec. One option, if you can read French, is to view the collection at the Bibliothèque et Archives nationales du Québec. 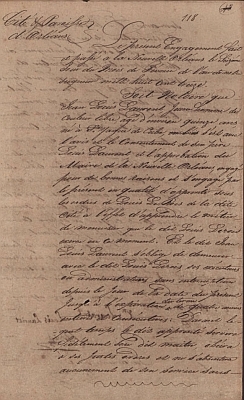 For the English speakers among us, another option is to view the Quebec notarial records through the digitized collection at FamilySearch, where more than four million pages are available to be viewed. The underlying records themselves, of course, are often (though not exclusively) in French, since that was and is the official language of Quebec. But enough of them are in English that even us non-polyglots can manage to see what kinds of gems can be found in notarial records there. And, for the record, a catalog search at FamilySearch using the search term “notarial” produces 36,565 results, of which 1,472 are online. They include, just as a few examples, notarial records from the Netherlands, from Luxembourg, from the Philippines, from Denmark, even from early St. Louis. So go for it — notarial records are great fun. And there really is a lot to see even at 3 a.m. in our bunny slippers. Image: Indenture of Jean Laurent, 1813 February 16; Free People of Color in Louisiana; Louisiana Digital Library. Judy, I have an image of you in blue bunny slippers. Do I have the color correct? Blue, pink, polka-dotted… I’m an equal-opportunity type!